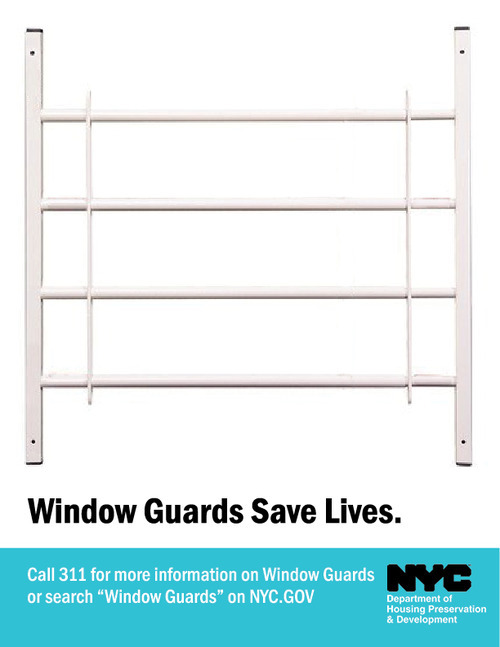 Every year in New York young children are dying or are being seriously injured after falling from unguarded windows. These deaths and injuries are preventable. The window guard law requires owners to send an annual notice to tenants of multiple dwellings (buildings of 3 or more apartments) regarding window guards. It also requires owners to provide and properly install approved window guards on all windows, including first floor bathrooms and windows leading onto a balcony or terrace in an apartment where a child 10 years of age or younger resides and in each common area window, if any, in such buildings. The exceptions to this law are windows that open onto a fire escape and windows on the first floor that are a required secondary exit in a building in which there are fire escapes on the second floor and up.